The charter team at Burgess are offering the 32m sailing yacht Necker Belle for charter between December 18th and 24th in the British Virgin Islands. 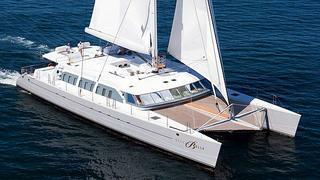 A high-volume catamaran, she accommodates eight to 10 guests pampered by six crew. A vast range of water toys is available and a qualified dive instructor is on hand for guests wanting to explore the ocean's depths. Necker Belle charters at rates starting from $110,000 per week.